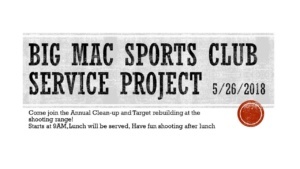 BMSC is hosting a service day at the trap range. We are going to repair archery and rifle target butts, trash pick up, trim trees, and trim grass. After cleaning up we will do some target shooting. Everyone welcome-> please bring your tools, rifles, bows, and shotguns and enjoy the day. Pizza and soda will be served at noon.